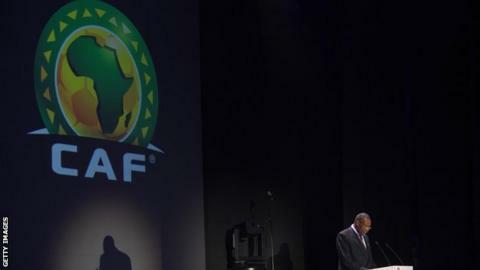 Cameroon, Ivory Coast and Guinea were named as future hosts of the Africa Cup of Nations by the Confederation of African Football (Caf) on Saturday. Cameroon, who will stage the tournament in 2019 previously staged the Nations Cup in 1972. Cameroon's bid was centred around four venues in Bafoussam, Douala, Garoua and Yaounde. Ivory Coast, awarded the 2021 edition, are also former hosts, having staged the Cup of Nations in 1984. The Ivorians plan to use five cities - Abidjan, Bouake, Korhogo, San Pedro and the capital Yamoussoukro. A Caf spokesperson later told the BBC that, on the basis of Guinea's presentation "and commitment", the committee "decided to exercise its power to make an immediate decision." Guinea have never hosted the competition which was first staged 57 years ago in the Sudanese capital Khartoum. Guinea's bid promised to use Conakry, Kankan, Labe and Nzerekore as venues. Ironically the country is currently banned from hosting any international football by Caf because of the Ebola virus outbreak. Zambia's bid-package for the tournament in five years' time included matches played against a backdrop of the spectacular Victoria Falls.